How important is cycling to you? You might enjoy riding and following the pro races but what if cycling prevented a civil war? What if two cyclists formed the greatest sporting rivalry of all time? What if cycling was inseparable from politics, religion, the economy and society? Welcome to Italy, at least to various points in Italian history when these claims have been made. The book opens with the tale of Enrico Toti, a one-legged soldier who cycled around the front line of the First World War and became a wartime hero in Italy. His tale mirrors the early era of race reporting where nobody could verify a story and newspapers competed to outsell each other with tales of heroism. The “cycling soldier” was no racer, he just used the bike for mobility. But with Toti author Foot is able to show how myths are created, how political forces in Italy appropriate tales of individual actions in order to make a story about an entire nation. This scenario will be repeated with many racing cyclists in the years to come. The book is collection of chapters covering Italian cycling from the earliest of days until the present day in chronological order. Foot is an academic and it shows. First the chapters are self-contained, some facts mentioned in one chapter appear in another, almost as if each chapter could qualify for an academic journal. Indeed it is well-referenced with comprehensive footnotes. Best of all Foot is not a sports writer but a historian and brings a wider analysis to the subject because this is not just Italian cycling but the history of a nation told via sport. He is able to explain economic changes and analyse the political events around them. But don’t be put off if you’re worried about a heavy tome on twentieth century Italian politico-economics. Instead there is expert detail about the sport, from the pedalling style of Fausto Coppi to the blood chemistry of Marco Pantani. But cycling was so great to Italy that at times it was linked to wartime acts of heroism, other times to war crimes and it is said to have prevented civil war. Cycling was the talk of the Italian nation. Even the Pope spoke about Gino Bartali from the balcony of the Vatican. Given the way cycling crossed into politics, economics and religion Foot does a great job of explaining everything. One of the central tales of the book is how cycling has been used and appropriated. In 1948 there is tale that during the Tour de France Gino Bartali was languishing. But in Rome, Palmiro Togliatti, leader of the Italian Communist party, was shot and protests and strikes broke out across the country. Revolution, violence and even civil war could have broke out as anxious communist supporters across the nation waited for the signal to start a revolution. But the incumbent prime minister is said to have phoned Bartali in Cannes and asked him to win the race “for Italy”. Bartali won the next three stages and the Tour de France and talk of a revolution dissipated and workers returned to work. Did Bartali save the nation? There is an oft-repeated tale that Togliatti’s shooting in Rome contributed to Bartali’s win and in turn his triumph in France led to an eruption of national pride and joy that quelled the insurrection. Is this really so? Probably not, even certainly not. But the idea that a win in the Tour de France can prevent upheaval is quite something. Foot analyses the myth and those behind it. There are other tales when cycling becomes crucial to the national interest. See the story about Trieste and Cottur or the way the maglia nera for the last rider was able to quietly mock Italy’s fascist Blackshirts, a sign that an inglorious past was buried for good. Was Ottavo Bottechia murdered by fascists? Was Fiorenzo Magni a violent war criminal? The answers are not clear but that is the role of a historian like Foot who presents evidence and often the lack of evidence to support many claims and “truths” from the past. The later part of the book discusses the modern era with cynicism. Rightly so given the prevalence of doping and Foot hammers home the role pharmacology and cheating have played in the sport. This might disturb some but Foot is not an insider keen to promote the sport. I would say Foot misses some nuance, for example yes Ivan Basso was banned for doping but today he’s not the “extra-terrestrial” rider from the past, perhaps things do change. You can sense the appeal of a “golden age” in the past. A time when Italians cycled to work, whether in the factor or field, and when cycling was the talk of the nation, especially with the rivalry between Coppi and Bartali. Foot claims the pair’s duel was the greatest rivalry in the history of all sports and he makes the case well. But today millions commute by car, soccer is the national sport and today a quick scan of the top names in the Giro reveals several riders who have been banned in the past for doping. As such there really was a golden age, it is not a product of nostalgia but demonstrable and even quantifiable. A criticism of the book is that it is too short. There could be more chapters on other riders, more information on other races beyond the Giro and an explainer on more concepts in Italy. The topic of gregari, the team riders is mentioned and today this tradition lives on with the loyal helpers, especially at Liquigas. Some won’t like the cynical tone about doping but it is understandable and I’ve met countless Italians who shrug and say the sport’s pharmacological farce has put them off. A comprehensive and analytical history of Italian cycling. Some books repeat myths but this debunks a few and analyses others. Foot isn’t a cyclist but an academic and he places the sport in a historical context of a new nation looking for idols and shared stories. Many countries have foundations built on myth, history gets adapted to suit tales of heroism and nationalism. But perhaps only Italy has seen cycling intertwined with the creation of the nation and nationhood? Foot expertly covers the sport, analysing the economic forces that made bicycle delivery boys turn professional, the political currents that latched onto superstars and for the modern day, the reasons why the sport has fallen from its top spot. A solid read even if the evocation of a golden age implies today is tarnished. It’s a book you can probably return to in time to the tales and the references alike. Note the book has an Italian language edition too. Pedalare means “Pedal”. Some book reviews come with a note to mention the book was sent free for review but I bought this. A list of previous book reviews is available at inrng.com/books. Excellent review. Really makes me wanna read it. Seems like my kind of book. PS: You have a typo in “quiet something”. I read this via Kindle and enjoyed it immensely despite my work helping friend Bill McGann with his The Story of the Giro d’Italia (Volume 2 has just been released) and enjoying Herbie Sykes excellent Maglia Rosa. If you’re an unabashed Giro (and all things Italian) fan like me, this is sort of a golden age of English-language books ab out Italian cycling. I can only hope these spawn more efforts from other good writers. Nice review. The part in the book about the golden age makes it one of my favourite cycling books along with The Rider and The Escape Artist. Nice review – thanks very much. The book’s a great read – I thoroughly recommend it. Great to see more cycling histories being written, rather than market-friendly biographical rehashes. I like the way the heroics of the sport come alive against an historical backdrop. For those not put off by a more analytical frame, Christopher Thompson’s academic history of the Tour de France is also very interesting. I still think there is a great political history of the sport to be written (one of the reasons I like The Inner Ring!). Second that (or third, or fourth that…), really great book. Inrng – have you picked up on the Paul Fournel book the Bike Show covered a few years ago? I was a big fan, but know some people couldn’t get on with it; would be interested to hear another perspective on it. Yes, it’s “Besoin de Vélo” or something like “The Need for the Bike” in English. I’ve read it and enjoyed it. Perhaps time to read it again in time for the Tour de France and do a review? I’d be meaning to read this, now I will. Do you have a list of book reviews on here? Others have asked for this too, I’ll compile a list sometime soon. Now I’ll have to read this as well. I found Herbie Sykes’ book Maglia Rosa an excellent and would thoroughly recommend it. Italy has a fascinating history, maybe if history had been taught in the context of professional cycling I’d have paid more attention and not ended up a geeky engineer…. You can also listen to John Foot on the The Bike Show podcast (free on iTunes) – the previous episode also covers the Merckx books, also reviewed here. Well worth a listen. Mr. Foot’s perspective is not surprising if from a traditionalist’s point of view, meaning, like many of us, we don’t want things to change from “the good ol’ days.” It’s easy to become cynical when things change from how we liked them best. What I find heart-warming, comforting and sad all at the same time is that many of us reminisce about the way things used to be, typically when we were much younger than we are now. Things were better, purer and more favorable during our generation’s coming-of-age, right? Well, for many generations I think that’s true. I strive to be an optimist because the world, right now, is really tough to be in: economically, politically, environmentally, spiritually, etc. There’s a bumper-sticker I see here in the states all the time which reads, “I’d rather be here NOW.” That’s a tough statement to make, now, but it implies that we believe that we’ll persevere even in these very challenging modern times. In cycling, sure, after Merckx’s ’69 positive test and later on the rise and fall of Pantani, it’s easy to see how jaded or even disgusted one could become about our sport. There is too much to discuss here that contributed to the doping culture. “Win at all costs” became a motto for cycling and many, many sports at all levels. I like to put on my rose-colored glasses, put things into context, and move on. Yes, we still have dirty riders in the peloton, but I’m mostly pleased with what I’ve just seen during the last few weeks. Will we have another rivalry like Coppi and Bartali? I believe so. Maybe shorter lived. But the sport is global now so we may see rivalries form from different nations and continents and in various specialties: Cav and Sagan?, Nibali and Kreuziger?, Wiggins and Hesjedal?, Phinney and T. Martin?, Gesink and Contador? …just random picks without in-depth thought and regard for age differences, but the possibilities are there and I find this exciting for our sport! The Independent review quoted by Roadie above was written by me, and I think it’s obvious that Foot is more interested in cycling as a signifier of Italian history and modernity than he is in the sport itself. Certainly his excellent book on Italian football, Calcio, is livelier, as you might expect from someone who has loved both Argyle and Arsenal all his life. Italy as a concept remains problematic- David Gilmour’s recent Pursuit of Italy suggests that its history might have been smoother had it remained as several separate states, more Benelux than France. No wonder the Giro tries to reach every part of the boot. Yet historians often have interesting perspectives. Maybe the most illuminating book on the Tour de France is Graham Robb’s Discovery of France, which points out that the very phrase ‘tour de France’ was the traditional journey taken by apprentices learning a trade, and that plenty of rustics had ridden their bikes over the high passes before Henri Desgrange came along- in search of wives rather than fame. (The average height of Frenchmen grew by several centimetres after the invention of the bike and the concomitant opportunity to marry outside the pays to an unrelated lady). Certainly cycling cannot be separated from the wider world beyond the road, much as it loves its own mythology. Benjo Maso’s witty deconstruction of them, The Sweat of the Gods, is well worth a read. This looks interesting, incidentally. Road to Valour: Gino Bartali: Tour de France Legend and Italy’s Secret World War Two Hero by Aili McConnon and Andres McConnon. Out in June, and the first Bartali bio in English. Keep up the excellent work, Inrng. Yes, the book did remind me of The Sweat of Gods with the way it reviews and debunks some myths. 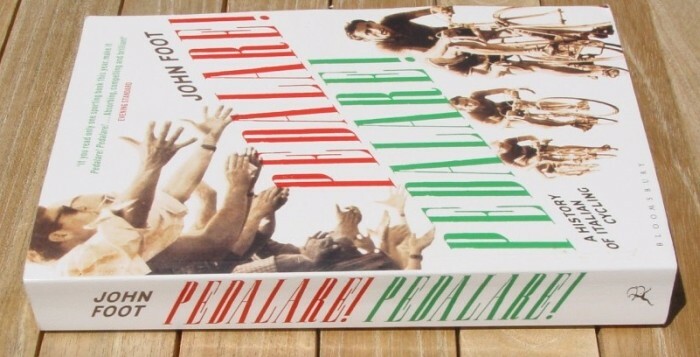 Aren’t there books by Italian authors on Italian cycling history? Why not translate these rather than write the next rehash of events that the author hasn’t participated in and describe people he does not know personally? What would you think of a book on the history and traditions of baseball written by an Italian? As a historian some distance can help. They can review archives and other sources to present the story rather than the myth. But there are many, many books about Italian cycling and Foot mentions a lot of these. La Gazzetta dello Sport has just started the release of a book series on the Giro. I think there are 27 books in all, sort of an encyclopedia of La Corsa Rosa. In Italian of course. Our friends at VeloPress are always looking for good books to translate into English but the rights fees sometimes get in the way I think, so it’s probably easier for an English-speaker to write their own and market it. In any case, the release of so many books about Italy and the Giro are very welcome after the saturation of the market for so many years with TdF stuff. BRAVI to all! I have a copy of this, but my dog chewed the cover off! He must have been as disgruntled as me at the lack of Gibo references in the index. Incidentally, I can’t be the only one whose first reaction to a book on Italian cycling is to scan the index for how much Gilberto Simoni there is in there? Does anyone know if there are plans for an english translation of his book Gibo D’Italia? I think his point about the “golden age” is that it is measurable. The talk of the nation, the column inches and even the Pope names riders in speeches, plus the way the sport is so important it is linked to the national myth. Good point about the manufacturers. If you told the tale of Campagnolo you could tell the tale of the Italian economy.